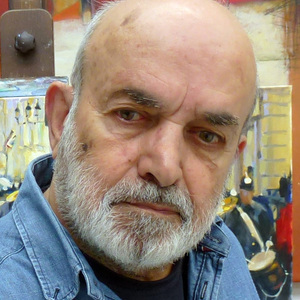 I was born in Teheran in 1931, into an Armenian family, and started painting at the age of 13. As a young artist I regularly participated in group exhibitions and one-man shows, exploring and recording a vast country on canvas. My paintings endeavoured to capture the richness of cultures, traditions and the architecture of past and present. My works culminated in the publication of "˜An Armenian Village' in 1984. From an early age, my travels influenced my outlook on art, and in particular classical Rome with its awe-inspiring power led to a series of church murals, including "˜The Last Supper' and "˜The Creation'. In 1971 I moved to London via Rome, where I studied at the Academy of Arts. I have painted in oils, acrylic and watercolour. In my formative years I studied Persian art at Isfahan, a cradle of Islamic art and design, and designed a 250 metre calligraphy frieze, which was installed in Riyadh Airport in 1985. More recently I was commissioned to design a 50-metre mural for the King Abdulaziz National Museum, Riyadh. My work is founded on the need to understand nature though the abstraction of form, light and colour. Distilling this essence, I have applied my artistic talents to capturing the diverse scenery of rivers in all its forms. I joined the Wapping Group in 2002 and feel very much at home in the company of like-minded painters, enjoying the endearing friendship of my fellow artists, who are dedicated to recording the essence of the Thames and the human activity that this great river supports on its banks. In 1977 I was fortunate enough to meet Aram Khachatourian in London, and was asked to paint a portrait of the great composer. This painting now hangs in the Khachatourian Museum in Yerevan, Armenia. Some of my works are currently exhibited at the Museum San Lazaro, Venice; the National Museum and the Museum of Modern Art, Yerevan; and the Aivazovski Museum, Theodosia. Also my murals are in Armenian churches in Teheran and the National Museum, Riyadh. A number of my paintings are with private collectors around the world. Exhibited: Biennale Venice, New York, Yerevan, Crimea, RIBA London, ROI, RSMA.